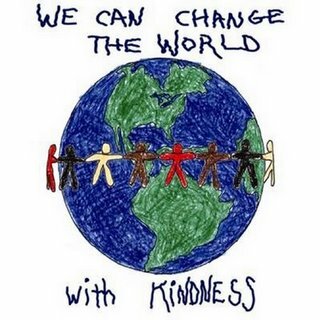 David shows kindness, compassion, and good leadership; Simon Peter does the same. David and Mephibosheth – David wants to know if there are any remaining relatives of Saul’s he should be showing God’s kindness to. One of Saul’s servants, Ziba, is found and he tells David about Mephibosheth, Jonathan’s crippled son; David arranges for Mephibosheth to brought to him from Makir’s house in Lo Debar. 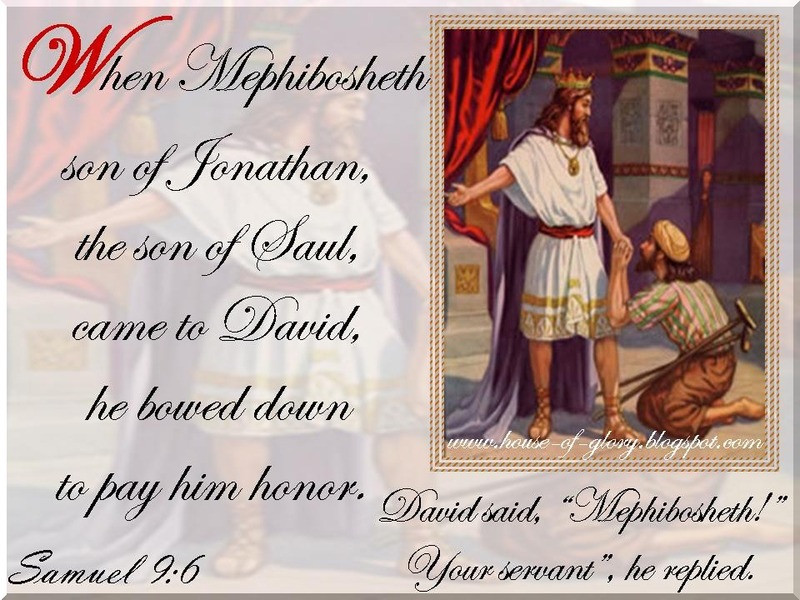 Mephibosheth bows down in honour of David, who calls his name. ‘Don’t be afraid…for I will surely show you kindness for the sake of your father, Jonathan.‘ David offers to restore all the land belonging to Saul, and pledges that Mephibosheth can always eat at David’s table. Mephibosheth can’t understand why the king is showing such kindness to ‘a dead dog like me’ (Mephibosheth has a very, very low view of his own self / worth). David fixes everything so that Ziba and his family can farm the land for Mephibosheth, who is looked after, along with his son, Mica, in Jerusalem. David had pledged his care and support for Jonathan’s family, and here he fulfils his pledge by caring for Mephibosheth and son. David Defeats the Ammonites – There’s a change of leader for the Ammonites – king Nahash died and his son, Hanun takes over. David sends a delegation to Hanun to express his sympathy and pledge of kindness. Some of Hanun’s noblemen, though, suspect that this delegation is spying for an attack. Hanun humiliates David’s men by shaving off half of their beards and cutting off their clothes at the buttocks, then sending them back to David. David suggests the men stay in Jericho until their beards have grown back (and that they put on some new clothes!!!). The Ammonites realise that they have offended David (‘they had become an offence to David’s nostrils’), and they hire 20,000 Aramean soldiers, along with the king of Maacah (with 1,000 men) and 12,000 men from Tob. They draw up battle lines, with the Ammonites at the front of their city gate, and the Arameans were positioned in open country. Joab takes the entire army out to fight, aware that they will be fought on two fronts (Ammonites in front and Arameans behind). Joab puts the best troops under the his own command against the Arameans, whilst he delegated the rest to Abishai, fighting against the Ammonites – with both keeping an eye on the other. Joab fights the Arameans, and they flee. The Ammonites also, then flee, back into their city. The Arameans regroup, however; Hadadezer brings other Arameans in to bolster the troops. They draw battle lines at Helam, under the command of Shobach. David calls all Israel’s army, crosses the Jordan towards Helam. In battle, the Israelites kill 700 charioteers and 40,000 soldiers, before the remaining Arameans flee. Shobach also loses his life. From then on, the Aramean kings made peace with Israel, subjecting themselves to the Israelites, and the Arameans were afraid to help the Ammonites again ! 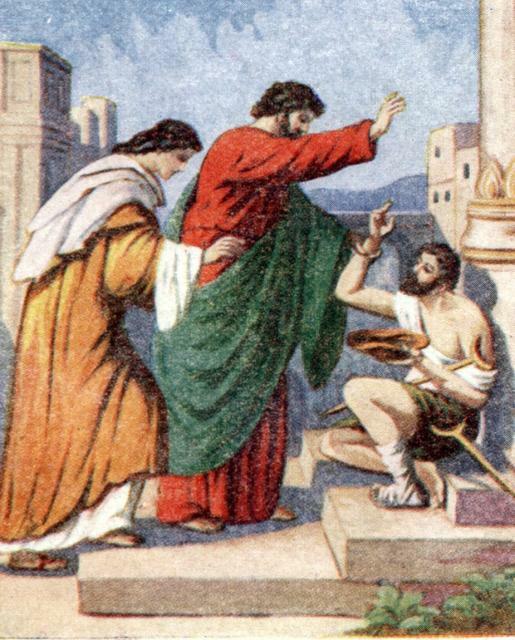 Peter Heals the Crippled Beggar – fresh from the events of Pentecost, Peter and John are on their way to 3.00p.m. prayer at the temple when a crippled man was brought to the temple gate (called Beautiful). The crippled man would beg there every day, catching people going into the temple. He asks Peter and John for money, and Peter has to tell him to look at them (he is so used to looking down, I guess, and simply begging without looking people in the eye – ashamed, or just so used to doing it, day after day?). ‘filled with wonder and amazement at what had happened to him’. Peter Speaks to the Onlookers – a crowd gather around Peter, John and the healed man, in Solomon’s Colonnade. Peter addresses them (he’s getting used to this preaching thing, now). Peter tells them that, though they acted out of ignorance, God brought His purposes to fulfilment. ‘Repent, then, and turn to God, so that your sins may be wiped out, that times of refreshing may come from the Lord’. Peter tells them, also, that Jesus will return, when all is ready for God to restore, and that everything they are now seeing and hearing, even the eyewitness accounts of Jesus, are a fulfilment of prophecy.